Of all the parasites found on our pets, fleas are the most common and apart from being unpleasant, they can cause harm, both to you and your pets. They are not confined to certain properties. It could be a flat in Bournemouth or Boscombe or a house in Charminster or Southbourne or a bungalow in Poole, Verwood or Christchurch. In some cases the owner or tenant may not even have a pet, but the previous occupier might have kept a pet and left behind a nasty surprise. The life cycle of a flea takes 2-3 weeks in a warm environment (eg a house with central heating) and consists of four main stages. Stage 1: The adult flea jumps onto a host (animal or human) and begins feeding on the host’s blood, this leads to itching and scratching in most cases and could transmit diseases. Stage 3: After only a couple of days, the eggs hatch into larvae. These larvae will retreat from light and immediately crawl deeper into cracks, crevices and carpets making them almost impossible to see. Stage 4: The larvae will then spin cocoons and when conditions are right, after a few days, they emerge as new adult fleas ready to start the cycle all over again. 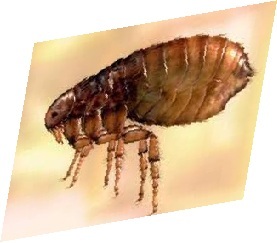 10 fleas can lay up to 15000 eggs in 1 month. A flea can jump as far as 33cm in one go. 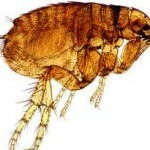 Fleas are able to survive all year round. 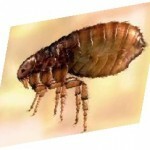 Fleas can survive up to 6 months in the outside environment. There are approximately 1400 species of flea of which up to 60 live in the UK. 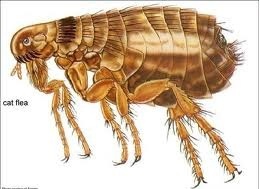 You do not need a pet to contract fleas in your home because they can jump onto you at any time, (your pet, friends pet, bus, train, taxi, office, hotel, plane, etc). 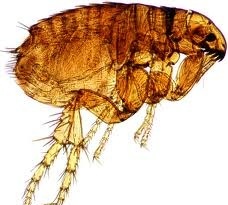 For every 5 fleas on your pet, 95 more are in your home. As the infestation moves through the property, the carpets, furniture, (including sofas and chairs) beds, soft toys, clothes, etc , become contaminated. Vacuuming will only remove about 50% of the eggs and larvae because they go deep and become entwined in fibres. If by now you are on the edge of insanity do not despair! The problem can be cured if the correct pest control strategy is adopted. Ask your vet which is the best treatment for your pet and maintain the treatment to prevent further infestation in the future, do not be fooled by cheaper products, a lot provide dubious results which may be short term only. Once the root of the problem is treated then it is time to turn to the property. Properties need to be thoroughly treated to break the life cycle and this will include cleaning curtains, soft furnishings, soft toys, sofas, bedding and laundering clothes . 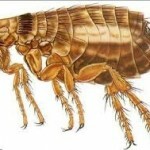 All carpets must be treated and any cracks and crevices that may harbour fleas. There are many treatments on the market and the advice on the label of each product MUST be followed, however if treatment is not carried out correctly or points are missed, fleas will quickly re-infest.